(Phys.org) —Four noted biomedical researchers have banded together to write and publish a Perspective piece in the journal Proceedings of the National Academy of Sciences. In their paper, the four outline problems they see with the current system of biomedical research in the United States and offer what they believe are solutions to prevent stagnation in the field. Biomedical research in the United States has, by any measure, been one of the great success stories of the modern era, bringing to the world increased knowledge of biological systems and medical advances at a breathtaking pace. The problem is, the researchers claim, is that past success does not guarantee a bright future. In their paper, authors Bruce Alberts, with the University of California, Marc Kirschner, with Harvard Medical School, Shirley Tilghman, with Princeton and Harold Varmus with the National Cancer Institute suggest that the system currently in place is unsustainable. At the root of the problem is the way funds for research are allocated, generally by the government in the form of grants. Because agencies such as the National Institutes of Health are subject to the whims of Congress, the amount of money available for research varies. Over some periods, it can be quite a lot, in others, such as in recent times, the amount has been less. The good times have led undergraduate students to believe that there is an ever expanding job pool available, which in turn has led to a glut in graduate students and post doctoral fellows. The oversupply has led to diminishing pay scales and decreased faith by those in the field of the value of their work. Alberts et al, contend that the research community, including those that offer funding should embark on a path to "confront the dangers at hand" by rethinking how research is funded, how it's staffed, and ultimately how it's organized in general. They go into great detail describing several possible solutions, which ultimately boil down to a means for paring down the number of graduates in the field. Of course this is not the first time noted scientists have issued warnings about how biomedical research is conducted in the U.S., many others have come before, particularly during times when funding has slowed. The overriding concern typically hovers around the central problem—that of variable funding, and how to fix it. In this new paper, the authors suggest that a means be put in place to even the flow, a suggestion that has been made many times in the past. The problem with that approach of course, is that only Congress can make it happen, and to date, they have shown little inclination to do so. I'll pay almost anything just to keep these academic whiners off street corners. "At the root of the problem is the way funds for research are allocated"
No, fairly obviously, no. More support is needed, of course, but the unsustainable growth in researchers would still be there regardless of whether there were small increases in funding. When each PI needs an army of cheap labor in the form of grad students and postdocs, rotating out year after year, you have an unsustainable exponential growth in PhDs. This is obvious to everyone except the PIs that profit from the system. Seems that Alberts and Varmus are getting ready for retirement. Where were they two decades ago when it was obvious that we were heading here? Profiting from big labs, that's where. And the funding crunch IS NOT the biggest problem with the current system. There's competition that keeps everyone sharp and then there's overcrowded rat cages where the young are eaten. Misconduct, plagiarism, unsupported conclusions, irreproducable results, deception, cynicism, are all at record highs. Ted Kennedy used to steer much of that funding to MA. Now, the whims of congress are cutting MA off from that gravy train. Cut all govt grants and eliminate the whims of congress. "Ebola, scary as it is, has only made about 2,500 people sick since it was discovered in 1976, killing about 1,700 of them. So the market for a drug like this is tiny. Still, Sheridan says his company has good reason to pursue it, beyond his desire to address an important public health issue. "There is a market, and the market is the U.S. government," he says. The government has promised to buy a stockpile of drugs that are effective against Ebola, in case someone should try to use it as a biological agent on the battlefield, or in an act of terrorism." This type of govt funding is legitimate as the function of the govt is to protect property. I thought by unsustainable they may have been talking about the prices of biomedical equipment. 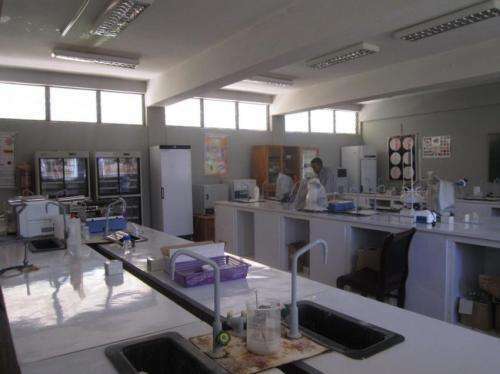 A laboratory incubator costs 10-20 thousand. How come an incubator costs 10x as much as a kitchen oven? The oven also has a temperature control and actually a much more powerful heating element, and I'm sure it has to go through very rigorous safety testing as well. A laboratory shaker costs $800-2000. This is essentially a ceiling fan motor connected to a metal plate with flask holders. What do you get for the 50x markup? How many times do your replace a ceiling fan in a lifetime?? The amount of waste generated is staggering as well. You can buy reusable glass flasks for $2 a piece or buy disposable ones for $5 a piece. Everything in a bio lab is disposable; except for the heavy equipment which is severely overpriced as well! The US government will give you money for all of this, in science as well as in healthcare. That money might as well be given to biomed companies directly. This is in sharp contradiction to steadily increasing http://moebiobarc...-usa.png did cost $50 before then years, not it costs $28.000. Apparently the USA economy failed in the price regulation. It's capitalism. When companies figured out they could charge whatever they want for drugs and technologies, they did just that. Now, even those the cost of manufacture is lower than ever, the shelf price is as high as they can get away with. If the same laws applied to medicine and technology as does to grocery store price gouging, this would not be allowed. There should be a legal limit to the profit margins of products and services in the medical industries. It is in my view immoral to charge more than the cost plus a small profit margin for medical aid. most of the technology we use was developed through government grants. Telephone lines, electric grids, computer networking, weather radar and satellites, etc. What grocery store price gouging laws?